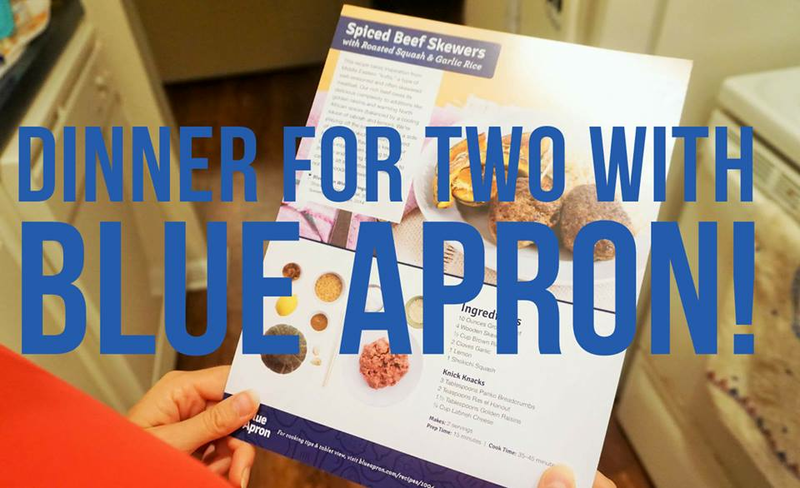 We are back for round three with Blue Apron and we couldn't be more giddy. Honest to goodness everyone this was probably our favourite dish we got to make, and that's saying something considering we savored every bite of both the Spicy Hoisin Chicken and Cod Sandwich meals we made previously. However, this recipe for Spiced Beef Skewers is topping the list because we have never made anything quite like it before, or really ever thought we could actually make anything like it before. We are drooling just thinking about this dish and are so sad we don't have plates full of it in front of us right now. So, this was everything we needed from our box, all portioned out and prepared for us. We get so happy when preparing food, setting out all our ingredients, ready to pour all our love and passion into whipping up something fresh and tasty. That may sound corny, but we truly love to cook. Food always makes us feel grateful and thankful and every time we cook we want to do our best to learn and cook with love. Most definitely traits we get from Nanna and Grandad. We love our veggies but don't often buy produce like Squash, so we were very excited to experiment. Our Auntie makes the most awesome roasted vegetables so we were looking forward to digging into this. A little home comfort if you will. :) Sidenote: It's been two weeks since we made this recipe and we have been buying Squash regularly, cooking it up like exactly like this! The smell in our kitchen at this point was mouth watering and we couldn't wait to get stuck in. Kelly's Chris was due home from work and we were so excited that he would get to have this for dinner. Definitely something different on the menu and something we knew he would love. Ta da! Oh my goodness, heaven on a plate! :) We don't think we could possibly get across quite how happy this food made us. You guys know how much we love food and this dish was phenomenal. The roasted squash melted in our mouths and the flavors of salt, pepper, olive oil and lemon rind was scrumptious. We love lemons. As for the spiced beef skewers...yes please...we'll have ten more...like now! They were ridiculously tasty, juicy and just all round yummy. It paired so nicely with the cheese and lemon sauce and truly taste like something you would get at a restaurant.